Purpose: To inform members about Immigration issues and to support the efforts of the USCCB to promote and advance Comprehensive Immigration Reform through public actions and support of positive initiatives. Pete Ruggere MM is the AUSCP delegate to the USCCB Committee, Justice for Immigrants. America and Crux report on Catholic leaders’ concerns about migrants seeking asylum. Click on the two high-lighted entries to read the complete stories. LINK: CLINIC Catholic Legal Immigration Network, Inc.
U.S. Bishops' Migration Chair: Keep families together. READ the statement from the U.S. Bishops HERE. Read and Act. Read the latest message from Peter Ruggere MM, study the issues, and take action. NEW: Archbishop Hebda of St. Paul-Minneapolis insists, Catholic Voices belong in the Public Square. He answers the challenging question: “Are we saying that illegal aliens are far more important than 60 million dead babies?” READ HIS COLUMN HERE. 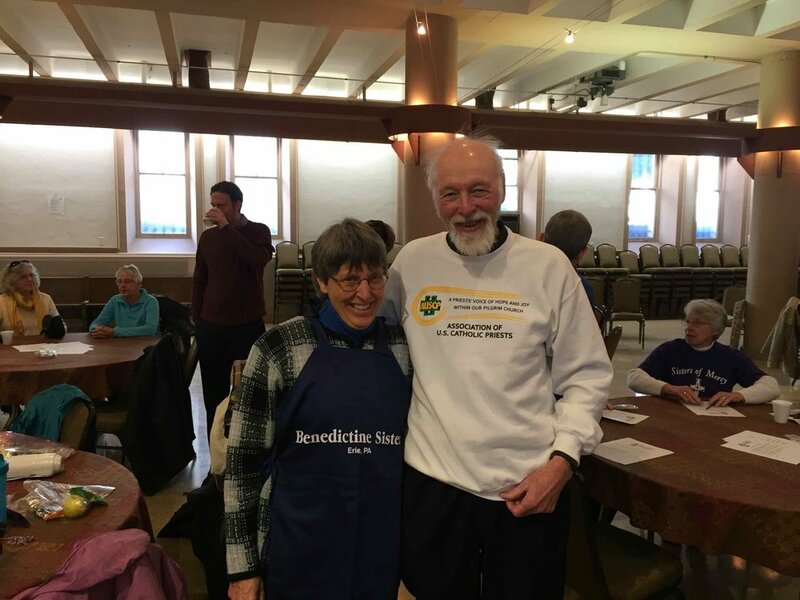 Father Bernard Survil, a founding member of the AUSCP from the Diocese of Greensburg, and a long-time activist for immigration and civil rights, stands with Sister Ann McCarthy of the Erie Benedictines, in preparation for the February 27 Catholic Day of Action in support of Dreamers. Both were arrested later that day. Father Survil said he was one of 46 people arrested for obstruction of justice, after they refused to leave the rotunda. Following their arrests, guilty pleas and fines, the Catholic activists were released. A report by the National Catholic Reporter described the scene and the reasons for the action. READ IT HERE. Sister Maria Lucey, associate director of the Franciscan Action Network, Patrick Carolan, FAN executive director, and Father Bernard Survil, pose before departing a staging area for the Catholic Day of Action. Catholic News Service provided details February 23, ahead of the planned activity. The CNS article included the AUSCP among Catholic voices. READ the CNS story HERE. Catholic News Service also reported an update after the Catholic Day of Action, including a quotation from Bishop John Stowe of Lexington, an AUSCP member. READ it HERE. From America: "Why my priesthood calls me to resist immigration injustice"
• The BRIDGE Act offers a temporary bipartisan legislative solution to protect DACA youth. The BRIDGE Act is a legislative effort which would protect DACA youth by providing them with temporary relief from deportation for up to three years. It is intended to serve as a stop-gap measure while Congress seeks a permanent solution to reform our broken immigration system. • DACA youth enrich America, and they should be allowed to continue to reach their full professional potential. There are more than 740,000 young people who have benefitted from DACA. They are contributors to our economy, academic standouts in our universities, veterans of our military, and leaders in our parishes. The BRIDGE Act is a bipartisan measure that aims to ensure that DACA youth are able to finish their education and continue to contribute to our nation and communities. • We have a moral obligation to shield DACA youth from deportation and keep their families together. As Catholics, we believe in protecting the dignity of every human being, especially that of our children. The Catholic Bishops have long supported DACA youth and their families. These young people entered the U.S. as children and know America as their only home. They complied with our government in good faith - coming forward and providing personal information, submitting to a background check, and paying a fee. The BRIDGE Act would help to protect DACA youth from deportation and prevent devastating family separation. • The BRIDGE Act makes financial sense. Ending work authorization for DACA recipients could cause businesses and employers to incur unnecessary turnover costs of $3.4 billion and could cause far-reaching unemployment, leading to the immediate job loss of 645,145 DACA recipients currently employed by businesses in the United States. Additionally, ending DACA could reduce Social Security and Medicare tax contributions by DACA employees and employers by $24.6 billion over a decade, weakening the Social Security and Medicare trust funds.